You can easily view your project task mind map as a Gantt chart. You can do this by opening your map in ConceptDraw PROJECT. This way you are switching between views without creating extra files — working with the same file in both programs. In ConceptDraw MINDMAP you should click the Open in PROJECT button . If you are using Windows, you can find it on the Home tab. MacOS users can see it on the Main Toolbar. Press Save in the dialog box that appears. Your file will be opened in ConceptDraw PROJECT. The relationships will be displayed as task links. The Topic Data displays as projects hierarchy and information on resources allocation. ConceptDraw MINDMAP offers a set of tools allowing you to create presentations from a mind map. With one just click, you can generate a slide show. You can build multiple presentations and store them in a single map. Our suggestion is to use the Presentation Mode of ConceptDraw MINDMAP to perform your presentation to an audience. Run ConceptDraw MINDMAP and open a file you want to present. Slides will appear with animation. Navigate the slides using the arrow keys or mouse clicks. If you want to show a specific slide, choose it from the list in the context menu. Result: Your audience will be impressed by your mind map presentation. Is it possible to share mind maps created with ConceptDraw MINDMAP with those, who use other mind mapping applications? This is important because mind mapping always means some processes of collaboration. 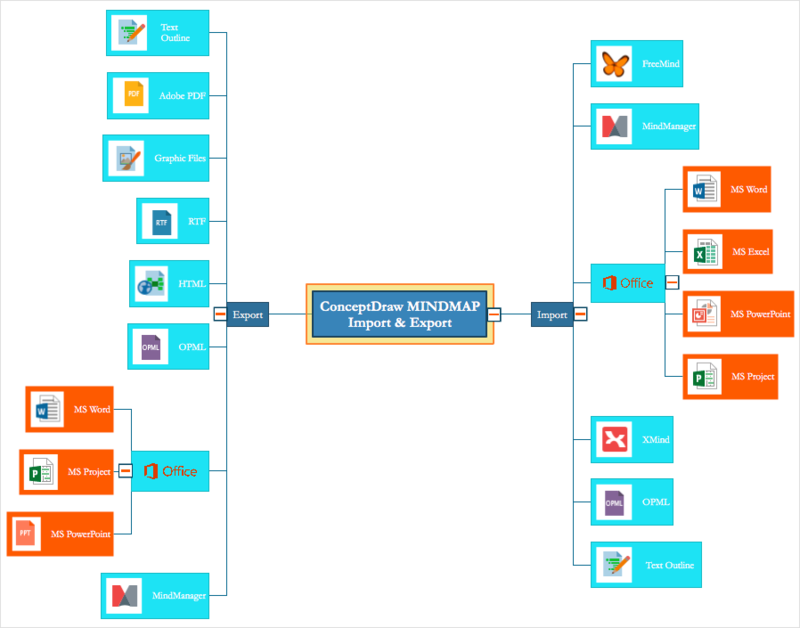 Because ConceptDraw MINDMAP allows you to save your mind maps in MMAP file format, you can freely exchange your mind maps with any software for mind mapping which supports MindManager's MMAP format.